2020 may just be the year the Trump administration is ready to kick the seemingly broad and ambiguous topic of “civil service modernization” into high gear. President Donald Trump’s 2020 budget request, which the White House released with more detail Monday morning, is packed full of recommendations designed to modernize the decades-old civil service system and acknowledge the nature of changing work. The proposals include familiar ones aimed at freezing across-the-board federal pay freezes and cutting employee retirement and health benefits. But the President’s 2020 budget request also makes a wide variety of recommendations designed to give agencies much more flexibility and authority to hire, compensate and manage employees based on their occupations, skills and specialties. Referencing the numerous studies that came from good government organizations such as the National Academy of Public Administration last year, the Trump administration reiterated its plan to pursue these recommendations through both statutory and administrative changes. Perhaps most notably, the administration said it wants to work with Congress to “cull the approximately 5,000 statutory and regulatory rules that, over time, have created an incomprehensible, administratively burdensome and unmanageable civil service system,” the budget proposal reads. The detailed version of the President’s request includes many of the administration’s civil service proposals. But a joint congressional budget justification from the General Services Administration and Office of Personnel Management includes many more — and reflects the administration’s desire to quickly reorganize the agency. As was suggested during last week’s initial 2020 budget roll out, the Trump administration is — for the second consecutive year — proposing a pay freeze for civilian federal employees. Again, the administration cited “long-term fixed costs” of across-the-board pay raises and automatic “step-increase promotions” for employees on the General Schedule as the reasons behind its proposed federal pay freeze. According to the budget request, agencies spend 1 percent of their payroll today on employee awards — but in a non-strategic way. The Office of Management and Budget will issue guidance that describes how agencies can use awards funding to reward the highest-performing employees, the 2020 request said. 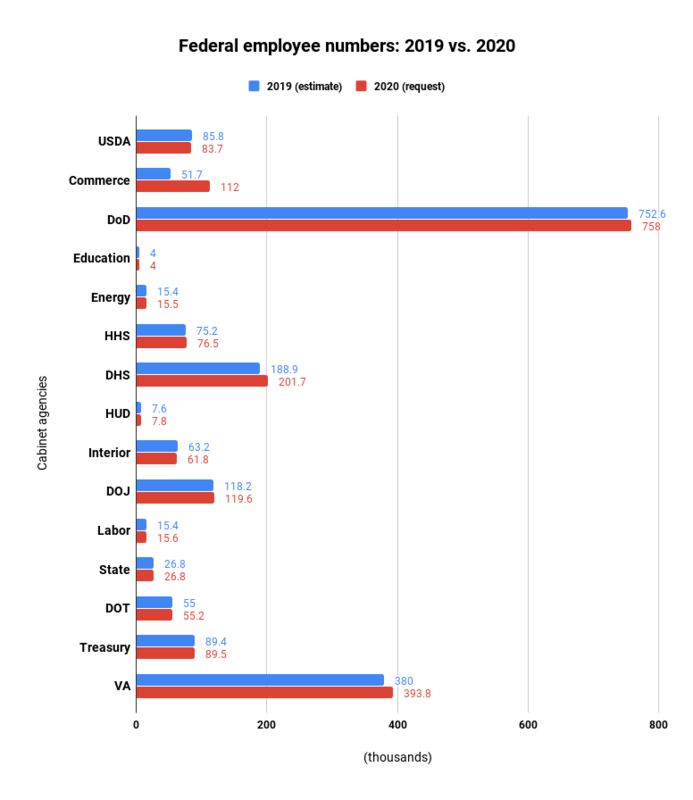 The 2020 budget request offers up slightly more detail than its 2019 request on the administration’s plans for performance-based pay. But it doesn’t acknowledge the role that Congress can and has played in the past in setting federal pay. Congress last month passed a 1.9 percent pay raise for civilian employees, overriding the President’s planned pay freeze. In addition, the President’s Pay Agent, which consists of the Labor secretary and OMB and Office of Personnel Management directors, plans to establish several special occupational pay systems, as OPM suggested last fall. The pay agent plans to solicit feedback from employing agencies, labor unions and others, publish the plans in the Federal Register and hold a few public hearings on the new, special occupational pay system, the budget request said. The pay agent will also develop new approaches for compensating employees in mission critical and emerging occupations, especially for those in STEM positions. Currently, federal employees receive 10 paid holidays, up to 13 sick days and anywhere from 13-to-26 vacation days, depending on tenure. As last week’s 2020 budget summary described, the White House for the third consecutive year described a series of proposed cuts for both current federal employees and retirees, with the hope of saving $102 billion over the next 10 years. An elimination of the FERS Special Retirement Supplement, payments for employees who retire before age 62. But Monday’s detailed budget request sheds more light on the administration’s plans to allow agencies to appoint and compensate new “term employees” with special education, experience or competency levels to address critical hiring needs. “Term employees” would receive an “expanded defined benefit contribution through the TSP,” according to the White House request. The existing federal retirement system discourages the 70,000 existing term hires, because those terms falls short of the five years it takes to become vested in the defined benefit program, the administration said. Term employees hired under this new authority could be paid up to Executive Schedule level 2, according to a joint congressional budget justification from OPM and the General Services Administration. Term appointments would run for up to three years with the option for two one-year extensions, OPM and GSA said. These employees would serve at the pleasure of the agency, meaning they wouldn’t face the same competitive hiring hurdles they must undergo today, and they wouldn’t have Title 5 disciplinary appeal rights. To be clear, agencies, in some cases, already have the ability to hire employees on a temporary basis. But the Trump administration’s proposals clearly reflect a desire to expand both the number and type of term employees that agencies can hire. And in a nod to the “21st century gig economy,” the administration also proposed new flexibility that would allow agencies to make non-competitive term and temporary appointments for up to 18 months to address any critical hiring need, the OPM/GSA budget justification said. In addition, the administration reiterated its desire to develop an industry exchange program for STEM occupations, which would allow agencies to move talent and expertise in between government and the private sector more easily. OPM has advocated for this idea in past legislative proposals. OPM and GSA are also advocating for the creation of a new critical skills incentive, which would allow the OPM director to pay up to 25 percent of basic pay as an additional perk to employees with high-demand skills. The proposal would also allow agencies to review, manage and revise these critical skills incentives as needed. The White House said it will continue to invest in reskilling existing federal employees to prepare them for a new era of work, citing recent stories with the Federal Cybersecurity Reskilling Academy. Unlike previous years’ budget requests, the President’s proposal doesn’t make drastic cuts in the overall size of the federal workforce. In fact, OMB didn’t set target personnel levels for each agency. 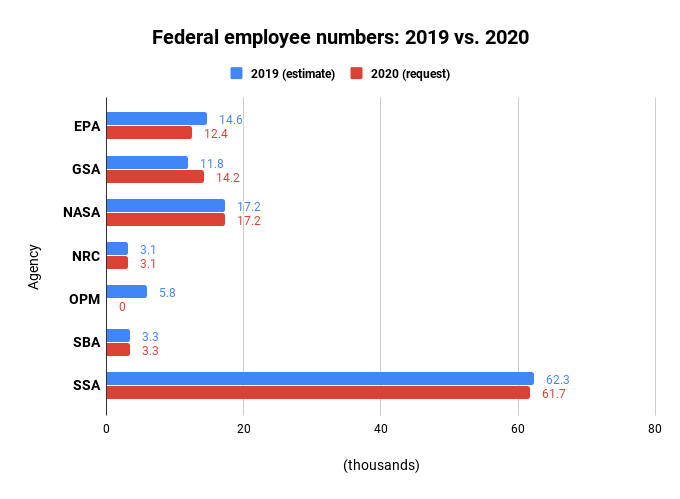 The number displayed in the chart below reflect personnel estimates for both 2019 and 2020.